NASA Administrator Jim Bridenstine said the defeat of Rep. John Culberson, who chaired the appropriations subcommittee that funded NASA, was a concern to him as the agency seeks to keep its exploration programs funded. WASHINGTON — NASA Administrator Jim Bridenstine said Nov. 15 that the reelection defeat of a key appropriator, and the potential for budget cuts next year, is a cause for concern for him as he tries to balance the agency's priorities. "NASA has benefitted greatly from one congressman in particular, John Culberson," he said. "He will not be back in the next term, and that is of concern to me personally." Bridenstine praised Culberson as "an amazing champion for NASA" for his work on the appropriations subcommittee. "He was in the right position at the right time as the chairman of the commerce, justice and science appropriations subcommittee in the House, and he has increased our budgets significantly." Such a cut, he suggested, would imperil its exploration plans. "If that materializes, no, we're not going to have what we need to go to the moon," he said. "We're certainly not going to have what we need to put boots on the moon." Bridenstine said he wouldn't try to compensate for any cuts by taking money from other agency programs to keep NASA's exploration efforts funded. "If we start robbing one part of NASA to feed another part of NASA, we will lose political support in a heartbeat," he said. "If we start pitting one part of NASA against another part of NASA, we will in essence be pitting one part of Congress against another part of Congress, and then we're not going to be able to accomplish most of what the president has assigned us to do in Space Policy Directive 1." Bridenstine was responding to a question from committee member Harrison Schmitt, the Apollo 17 astronaut, who was concerned about the level of funding reserves available for NASA's major exploration programs. "We're okay for now," Bridenstine said. "I'm sounding a warning." He said later the specific issue of reserves had not come in discussions with the Office of Management and Budget. 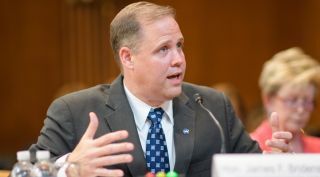 Despite that potential funding problem, Bridenstine said he was optimistic about the prospects for NASA's exploration strategy, including cooperation with international partners. He noted he had just returned from Canada, where he found "a lot of excitement" about lunar exploration. "I find that everywhere I go on the planet," he said. "There's a lot of international support for going to the moon." That cooperation, he said, is essential to keeping the exploration program sustainable. "There is a tradeoff between going back to the moon as fast as possible and getting humans to the surface tomorrow," he said, "and building a sustainable architecture where we can go back and forth really in perpetuity, and that's the objective."